In this post, we are going to walk you through the best illustrator WordPress themes for illustrators and graphic designers, artists and web designers, web developers and creative studios, as well as for any portfolio based website or blog. Illustrators are artists who create images based on certain written texts or stories. They are specialized in creating thematic pictures in books and magazines, as well as beautiful illustrations on the sites and blogs. Telling stories with the help of different characters, elements and scenes requires boundless creativity and enthusiasm. Well so does the creation of a stunningly versatile and effective website that will effortlessly showcase such creative works or portfolio items. In this relation, our collection of the most useful illustrator WordPress themes will contribute to the creation of any such personal or agency profile for highlighting whatever is relevant to your artistic work and services. As a professional artist, designer or illustrator, you probably have an amazing and highly developed imagination. While hearing words, your brain immediately creates vivid and original images in relation to them. The same technique can be applied with any of those illustrator WordPress themes. Each of them is armed with fully controllable and customization inclined layouts for you to use your fantasy and imagination to change and modify whatever is needed to make your online presence bright and unique. Give a whole new look to your old dated website or start everything from scratch with one of those designer and illustrator WordPress themes of SKT production and you will never regret it. Design Agency Pro is one of the productive platforms among the modern and creative illustrator WordPress themes to put your best qualities and talents into action and result in a unique demonstration of your works and graphical solutions. This HD and retina ready website builder is a mixture of clear coding and the latest design trends making your website fully responsive and functional with different tools and extensions. There are header and footer layout choices for making your site both informative and easy to use, page builder compatibility, shortcodes for contact form and more added to the theme for more versatility in performance. This responsive template will keep your website away from illegible texts and indecipherable images or portfolio items. Your web content is going to be totally presentable when accessed by different portable and hand held devices by the web guests on the move. The Art is a truly artistic and elegant template you can exercise to make your portfolio available online. This multifunctional template will be suitable for a design or illustrating agency of any caliber, from small to large, as well as private illustrators and designers, developers and artists working on a limited budget. This affordable and pocket friendly template is pixel perfect and devoid of drawbacks with absolutely any kind of device or mobile resolution. 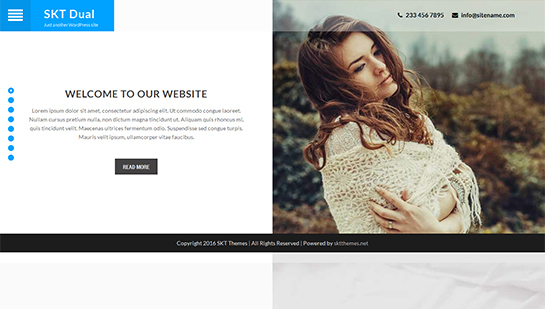 This shortcodes based and designer made template is custom built to professionally enhance every single part and aspect of your beautiful website and display your images on the homepage slider in the most accurate fashion. Separate gallery and portfolio section is also available to guarantee your valuable works and projects are well deployed and easy to view. Marvin is personal online CV and resume WordPress template that can be successfully used by illustrators and cartoonists, graphic designers and creative specialists, marketers and portfolio owners, etc. This highly elegant and serious looking template is wonderfully thought out and well structured to share all the necessary sections and content areas to give a full exposure of your personal profile, background knowledge, skills and proficiency, as well as portfolio and completed projects. The theme is easy to manage from the backend with colors and fonts controls, shortcodes and customizer options, plugin compatibility and more. It is also translation ready to provide your resume in different languages and draw the attention of more partners and employees. SKT Tube is a highly competent and functionally cutting edge ecosystem you can find in our collection of the illustrator WordPress themes. This template enables you to get your visual imagery easy to find and perceive for your audience. In this spectrum, homepage video slider is loaded for you to select from your portfolio works and introduce them to your website guests. You can also change the default slider with another one for better disclosure of your talents and expertise. You can also freely use footer and header areas to add your logo, contact info, social media links and more. Contact form is already enabled, however you can try and test other forms as well with relevant contact form plugins. Photodock is another valuable piece of website toolkit that is both creative and entertaining and ready made to capture the people attention at a first glance. 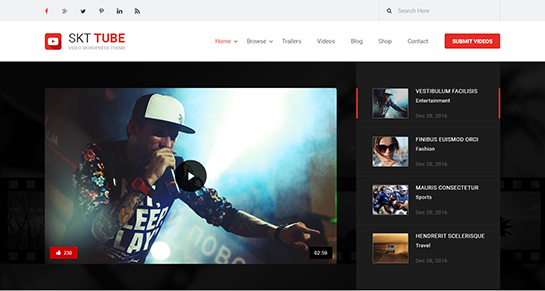 Image and photo based, this top quality and award winning template is suitable for designers and developers, artists and photographers to sell their services and relevant products, showcase portfolio and latest photoshoots, etc. What makes this theme so lovely is that the developers of the theme have kept the end user of the theme in the center of their attention and crafted Photodok to be fairly easy to use and customize. With colors and fonts arrangement, extensible framework and admin dashboard from the backend of the theme, anyone will be capable of making the most out of this template. SEO conversant and SMO optimized, SKT Dual is another seriously projected and all round website solution both for private and public usages. Thus multitalented template comes with roomy choices of gallery and portfolio sections so that your works and illustrations will be highly productive and user centric resulting in an excellent viewing experience. Moreover, it doesn’t matter whether your website user browses your website on his desktop or mobile, your content will be fully adjusted as per the device needs and screen resolution. If you are an illustrator and need a way to showcase off your thematic pictures and illustrations, then one of the best ways to get it the attention it deserves is to set up a WordPress site. WordPress is an open resource platform and as such, it comes packed with various tools, Widgts and plugins that you can use to showcase your images and reach out to more customers. You need to ensure that your illustrations are being displayed correctly and in the right format; with a WordPress platform and our illustrator WordPress themes, you should be able to create a stunningly versatile website with a rich display and ease of navigation. Granted, there are many illustrator WordPress themes to choose from, but with our vetted collection of some of the top illustrator themes and templates to choose from, you should be able to set up your own website in no time at all. Here are a few reasons as to why you should opt for an illustrator theme rather than cherry pick a random one. Niche specific: These themes have been designed especially for an illustrator or an artist; these themes are completely customizable and come with sliders and galleries that you can use to showcase your work. Moreover, some of them feature a variety of tools that you can use to optimize all the content, including the images on your website so as to make it more user-friendly and of course, make them more visible for the search engine bots as well. Customization: All these themes are completely customizable; you can change or modify anything; some of the themes even allow you to change the footer and header completely and even allow you to integrate a call to action in the same. These themes are HD and retina ready and come bundled with built in templates as well as compatibility with third party page builders, plugins that you can use to build the other pages of your website. Multi-functional: The great part about these themes is that they are multifunctional and come with galleries and sliders to showcase off your work. You can use these themes for a variety of websites, from setting one up for an ad agency to displaying your latest paintings. There’s no bar on what you can do with these themes and importantly, you can customize them from scratch and even use third party plugins to increase the functionality of your website. This is what you can expect with these themes and as you can see, it is so much better than depending on some random theme to showcase your theme to perfection when you have a niche specific theme that can deliver and more. Just make sure that you check out the theme to see if it is 100% responsive and mobile friendly since you would not want your customers to face any loss of functionality when checking out your website through their phone or for that matter, through other devices including iPad.